Scooper - Technology News: How should business react to China's water crisis? How should business react to China's water crisis? Home to a fifth of the world’s population, but only 7% of global freshwater supply, China is already at a disadvantage when it comes to ensuring it has enough water to secure its future growth and prosperity. Yet the price of water in China is much lower than the rest of the world – less than 50 cents per cubic meter compared to over $2 globally. And demand is only set to grow: by 2030 it is expected to outstrip supply, resulting in economic losses of $35 billion a year. This is not only a worry for China, but for the rest of the world. Given our global reliance on Chinese industry, the impacts of China’s water challenge have the ability to echo through supply chains across the world. With almost $1.5 trillion in water investments set aside over the next decade however, it is clear that the Chinese government is committed to tackling this urgent economic and environmental issue. All water users in the country, in particular business, will have to help deliver on these goals. But have companies truly understood the risks, and just as importantly, opportunities, that this new regulatory era will bring? This year, World Economic Forum experts ranked the water crisis as the top long-term threat facing humanity. However, dealing with such a complex long-term threat requires swift action now. Regulators in China have understood the need for such urgency. China’s 13th Five Year Plan places significant emphasis on tackling water issues, second only to achieving the countries energy targets. The Plan acknowledges the relatively poor quality of China’s water resources and the severe over-extraction of groundwater in some regions, setting the stage for more stringent regulation, enforced with strengthened environmental law. China’s Hebei province, which surrounds the capital Beijing, is an important case study for change. Located in the dry north of the country, Hebei is home to much of China’s heavy industry, in particular steel, but is also an important agricultural region. The competition for water among these water-intensive industries is strong – the region’s steel output is expected to be capped at 200 million tons per year, which would still require a dizzying 12 trillion gallons of water to produce. Now Hebei has become the test bed for the country’s first ever tax on water, with a pilot introduced this July. The extraction of surface and groundwater will now be taxable, with the aim of encouraging industry to focus on resource conservation and ways to drive forward sustainable growth. The consequences for not falling in line are also getting tougher. China’s revised environmental protection laws have an increased focus on strict compliance, while providing weight to punish environmental violations. This is not to be taken lightly. In January this year China’s top court upheld the original ruling of an environmental public interest case, ordering six companies to pay more than $26 million in compensation for discharging waste acids into two rivers in 2012, the largest environmental penalty imposed to date. The real test of course is not how sharp business believes the regulatory impacts will be, but what it is doing to improve its water management practices and innovate in the face of such challenges. Each year, companies are asked by their supply chain customers and investors to detail their approach to managing both water risks and opportunities through CDP, the global environmental disclosure platform. Based on responses from over 120 companies in China to CDP in 2015 , it is clear that Chinese firms appear at risk of being caught out by the changing regulatory landscape. This is especially the case when compared to multinational firms with operations in China. Just over a third of Chinese firms report conducting basic measurements of their water usage, this is compared to 82% of multinationals. As the adage goes, you can’t manage what you don’t measure, and adapting to regulation means companies will need to look at the basics of their water use. 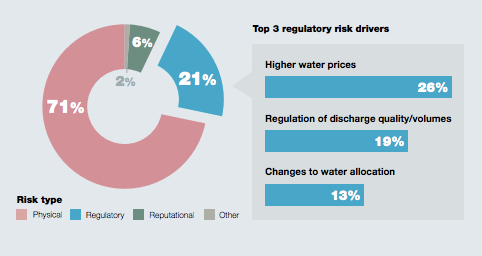 It is a similar story when it comes to undertaking water risk assessments, with just 41% of Chinese firms undertaking one compared to nearly nine in 10 of their multinational peers. The increasing cost of water means companies will have to rapidly rethink how they factor water into their business strategy. Already companies are seeing an impact: Volkswagen, Sekisui Chemical Co., Ltd. and Mars all report higher water prices, resulting in potential impacts such as higher operating costs or a reduction in revenue. Mars’s operations in China has experienced increasing water costs since 2009, in line with the government objective to limit water usage. While changing regulatory landscapes may place restrictions on businesses unprepared or unable to adapt, it is not always viewed this way by the private sector. Companies are starting to view effective regulation and sound water governance as fundamental to enabling vibrant business growth. No fewer than 74% of the companies in our analysis report that water action offers operational, strategic, or market opportunities. The Brazilian mining firm Vale, for example, has implemented a number of water efficiency projects throughout its global operations, including China, with estimated financial savings of $76 million. Examples include the installation of leak monitoring equipment and automated water meters leading to a reduction in total water demand. Companies, such as Vale, who are actively pursuing improved water use monitoring and efficiency may be well-placed to operate in a water-constrained environment, under regional and sectoral water caps. This story ultimately boils down then to the winners and the losers. China’s new approach to water indicates that the era of cheap, unregulated water is coming to an end. It is now up to business to decide how to succeed by pursuing a path of innovation and growth that respects these environmental boundaries. The business case for building a water-secure future has never been stronger.